Are ARRIS Group Inc. Shares a Buy? There's still time to buy this high-flyer. Shares of ARRIS Group (NASDAQ:ARRS) have been on a tear recently. With shares exchanging hands at a 10-year high, investors may be worried they missed a buying opportunity. Incredibly, shares of ARRIS are trading at historically low multiples, indicating the stock has plenty of upside potential. ARRIS is less expensive than its much larger competitor, Cisco Systems (NASDAQ:CSCO), as well as comparably sized EchoStar (NASDAQ:SATS). ARRIS is trading near a five-year low when compared to its sales over the last 12 months. Granted, ARRIS received a significant boost in sales from the acquisition of Motorola Home, but the last time it traded for a similar multiple, ARRIS was experiencing flat sales growth. In the near term, ARRIS expects continued sales strength on the back of its CPE division, which includes the Motorola Home acquisition. The sequential strength present since the acquisition indicates the company isn't done growing organically. Indeed, analysts expect 41% and 31% sales growth in the current and upcoming quarter, respectively. The long-term investment thesis for ARRIS remains intact as well. More pay-TV companies are moving toward IP-based services, which plays into ARRIS' wheelhouse perfectly. As IP-based video offerings from both cable companies and over-the-top services become increasingly prevalent, home networking equipment will be all but required for cable operators to install. ARRIS is not done growing sales by a long shot. Although analysts expect sales growth to slow significantly next year, it was less than a month ago when ARRIS surprised analysts with yet another earnings beat and a very positive outlook, requiring them to correct their views upward. 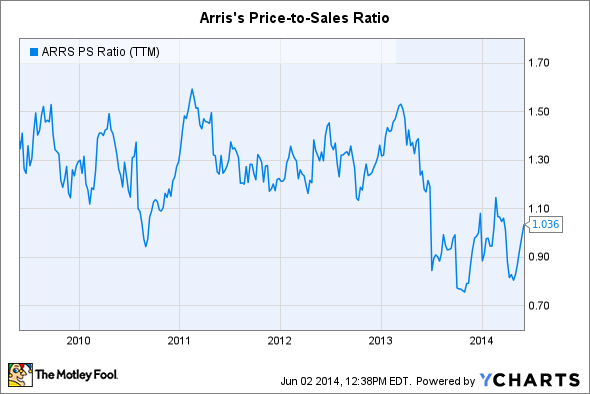 ARRIS' price-to-sales ratio of 1.04 is well below Cisco's, which sits at 2.8. Cisco has been consistently and increasingly profitable for years now, whereas ARRIS is just returning to profitability on a GAAP basis. As a result, the two companies' P/E ratios are also drastically different. Cisco, nonetheless, is perhaps ARRIS's biggest competition. The networking giant offers a similar set of products, including IPTV set-top box solutions. The company provides more than 40 million set-top boxes worldwide. Most investors know the company's strength's in networking equipment as well, which includes home gateways and its Medianet solution, designed to deliver video to any screen in the home. Another comparable company, EchoStar, is similar in size to ARRIS. With a market cap of $4.66 billion, EchoStar trades for a price-to-sales ratio of 1.42, still well above ARRIS' valuation. The company is expected to become much more profitable in the near term, though, as the company moves well into the black. Nonetheless, the long-term outlook is not nearly as optimistic as ARRIS', with analysts expecting earnings to grow just 5% per year over the next five years. Revenue is expected to grow at a similar rate over the next two years. EchoStar doesn't have the networking technology of either Cisco or ARRIS, which will put it at a disadvantage when it comes to growing its set-top box business. The company's close ties with DISH Network aren't likely in any danger, though, despite the move the satellite TV provider is making to ditch the dish and provide video over the Internet. Echostar's Slingbox may be its best asset in set-top boxes, but ARRIS' products such a home video gateways may eventually push Slingbox into obsolescence. Of the three, ARRIS appears to have the best prospects for growth, but it's priced for value. Despite the sudden surge in post-earnings share price , ARRIS Group is still priced just fine for a new investment; it's priced historically low and well below peers, on a price-to-sales basis. Meanwhile, the transition to IP-based video delivery is only getting started. The long-term outlook for ARRIS is arguably much stronger than the competition, and sales and earnings should grow considerably well into the future. At this price, ARRIS still represents a good opportunity.